At the beginning of 2019 I set myself a reading challenge, having let reading slide in previous years. 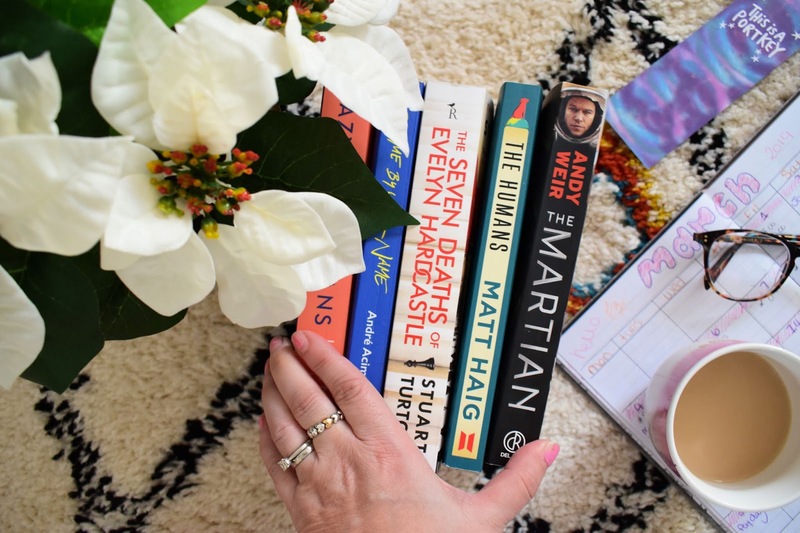 The challenge is going great, and in this post I am going to share what I read in March. In March I managed to complete five books not as many as I had hoped for with March being a long month, but I did have a few things in my dairy, so I'm still pretty pleased to of got five more books into my challenge. When New Yorker Rachel agrees to spend the summer in Singapore with her boyfriend, Nicholas Young, she envisions a humble family home and quality time with the man she hopes to marry. But Nick failed to give his girlfriend a couple of details. One that his childhood home looks like a palace and two, that he just happens to be the country's most eligible bachelor. Crazy rich asians is an insight into the world of the mega rich in Singapore. The battles between old money and new, and the most powerful of Chinese families living in Asia. It soon becomes clear to Rachel that this is a world she doesn't fit in and many refuse to welcome her into the inner circle. I loved this book and can't wait to read the next two books in the trilogy the only reason I didn't give it 5 stars is because I found it a bit slow at the beginning. I actually saw the movie of this book last year and thought it beautifully shot, so when I found the book I new I wanted to read it. I was not disappointed the story is tender, beautiful yet brutal. Obsession is a powerful emotion. During a restless summer on the Italian Riviera, a powerful romance blooms between 17 year old Elio and his father's house guest Oliver. Unrelenting currents of obsession and fear, fascination and desire threaten to overwhelm the lovers who at first feign indifference to the charge between them. She's been murdered hundreds of times, and each day, Aiden Bishop is to late to save her. The only way to break this cycle is to identify Evelyn's killer. But everytime the day begins again, Aiden wakes in the body of a different guest. And someone is is desperate to stop him ever escaping Blackheath. I know this book has divided opinions but I really enjoyed it. It is a completely different concept to any book I've read and for me that made it interesting. The story is a bit jumpy and can be a bit difficult to follow at times, this is a book you need to concentrate on. Nothing is quite what it seems and the characters are often quite unsettling individuals, whose sole purpose is to scupper Aiden's plans and get in the way of him finding out what is really going on. I love Matt Haig's writing style and The Humans is know exception. A real exploration into everything that makes us what we are. Written from the perspective of a man who is not what he seems and is in fact an alien species and finds humans and there ways confusing to say the least. I have know way to communicate with Earth. If the habitat breaches, I'll just kind of explode. If none of those things happen' I'll eventually run out of food and starve to death. A Nasa mission to Mars goes wrong and a man gets left behind. This is a story of survival, can a man all alone survive on Mars. Can he contact home, if he can, will they be able to rescue him. This book really explores how Mark Watney copes in a situation that to most people seems pretty hopeless. I enjoyed the story although found some of the more technical language hard to understand. For me the start was a bit slow but once the story progressed I really became invested in Mark and his mission to get home. Ahhh such lovely reviews. The Martian is one of my favourite books - and the film adaptation is brilliant. I've also read TSDoEH (yay book club later!) And I'm so undecided on it! I love The Humans, such a beautiful book!